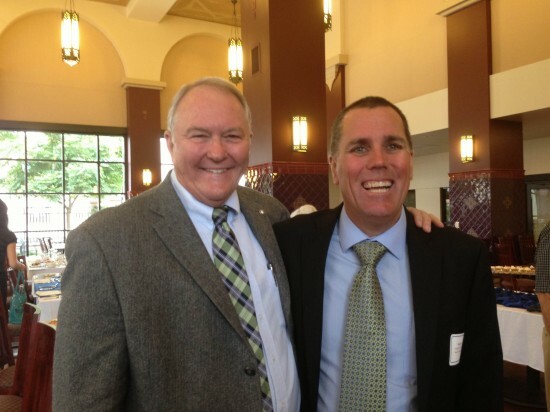 Brice Hunt was honored as the 2013 Educator of the Year on Thursday, June 6, by the Fullerton Chamber of Commerce. A math teacher at Buena Park High School (BPHS), Hunt has been instrumental in the exponential increase of enrollment in Advanced Placement Calculus at BPHS. The course has been recognized as contributing to the 400% rise in students enrolling at four-year colleges and universities. An employee with the Fullerton School District since 1989, Hunt has served as a mathematics teacher, department chair, mentor teacher and Project Start Peer Coach, Technology Trainer, and much more. He holds a B.S. in Mechanical Engineering and M.S. from UCLA as well as a M.A. in Education from National University. In addition to his outstanding work at Buena Park, Hunt is also an adjunct professor in the College of Education at Hope International University. Teaching two classes in the credential and Master’s of Education programs, he helps prepare students to teach math to grades 7 – 12. Hunt also devotes his time outside of the classroom to enriching the lives of children and adults in the community. One of the ways he does this is through JOYA Scholars, a nonprofit organization that inspires students to graduate. JOYA Scholars specifically focuses on the Garnet neighborhood where in 2009 it was discovered that not a single child from the neighborhood had graduated college in the last 20 years. Hunt sits on the advisory board of the organization and is proud to report that since its inception, the group has guided five students to college with two more admitted to UC Riverside and CSU Dominguez Hills for the upcoming year.